"Popeye's favorite soup! Good hot or cold. Soup also freezes well. 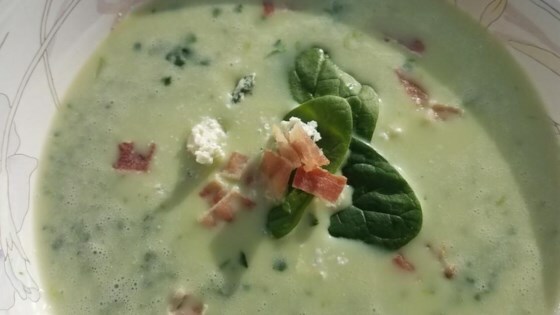 Soup should not be pureed or frozen with bacon. Reserve bacon until serving time so it will remain crisp. It is equally as good to serve this soup without pureeing, just add a splash of dry vermouth and lemon juice to each portion just before serving." In a large pot over medium heat, combine the butter or margarine and the onions. Saute for about 3 minutes. Add flour and stir well until mixed. Add broth, raise heat to high and bring to a boil. Whisk mixture to keep flour from clumping. Add milk, reduce heat to medium and simmer for about 5 minutes. Add the blue cheese and stir until blended, then add the spinach and cook 3 more minutes. Add the cream, bring just to a boil, turn off heat and stir well. Add salt and cayenne pepper to taste. We found the blue cheese to be just a little bit funky in this, despite the fact that we like blue cheese quite a bit. Live and learn -- nothing wrong with this recipe. Thanks!